A three-season room transforms your patio into a living space you can truly enjoy in all but the harshest winter weather. It's a space where you can relax and bring some of the outdoors in without worrying about wind, rain, bugs or direct sun. Many three-season rooms are add-ons to a home which leaves homeowners wondering just what type of flooring to choose. You likely can't match the exact floor of the room that it extends off of - and you probably don't want to. What are some good choices of flooring for a three-season room? We recommend you start by looking at hard surface flooring for your three-season room. Flooring choices such as tile and waterproof composite flooring bring just about any look you desire with the practicality this room needs. Tiles is a great choice for a three-season room. The natural materials and styles of tile lend themselves nicely to a room that is often designed with large windows to incorporate the look of nature. Tile flooring used to be synonymous with ceramic tile. Not anymore! Tile flooring today comes in a beautiful array of materials and styles. Some of which look like tile and some that look like high-end stone or even hardwood. Resilient flooring is a type of luxury vinyl created using high-definition printing so that it has a highly authentic appearance of either stone, ceramic or wood. As an added bonus resilient floors also hide imperfections in subfloors and are water resistant or even 100% waterproof. Resilient flooring choices are a great way to incorporate the warm, comforting look of wood in your three-season room without any concerns about wood in an environment that tends to get a lot of sunlight and is often exposed to water from open windows on a rainy day. How do you choose the right floor for your three-season room? We recommend starting with the look you want. Some people want the three-season room to feel like an extension of the house and thus to carry some of the same designs or colors. Others want the three-season room to feel like a retreat to nature and they want a floor that enforces that image. Hard surface flooring can bring any of these looks to life. Once you have the style in mind, start looking at materials to pick one that appeals to your eye and your budget. Want to add a touch of softness? Consider an area rug in the sitting area or perhaps as a transition in the entry between your home and the three-season room. 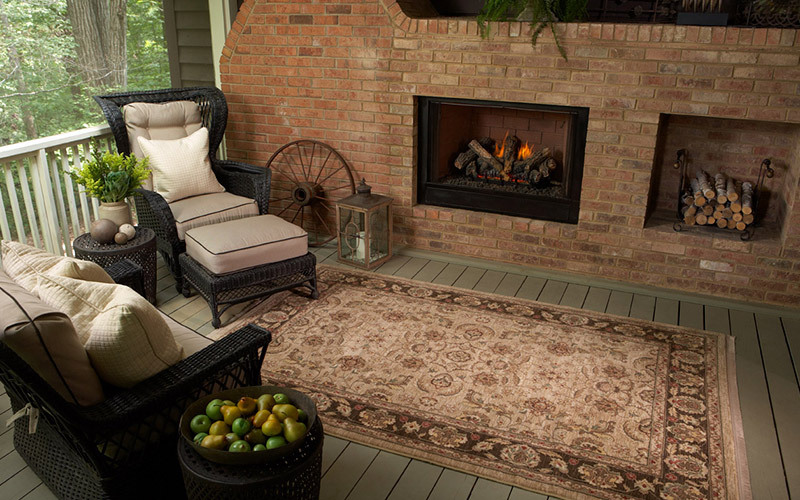 Area rugs are a great addition to hard surface floors in any room and they can add the perfect touch of comfort to your indoor/outdoor retreat.